Casa Ionio is directly at the sea: it is an apartment with fantastic sea view. You can see Taormina and also Calabria in the distance. Guests can access the sea directly from the house through a path beside the house that goes directly down to the lava rocks. The house has a living room with fireplace and sea views, double glass doors to the terrace with a great view that stretches from the typical lava rocks in front of the house to Taormina in the distance. On the other side of the living room there is has a terrace with dining table where you can sit out of the wind. From here you can reach the roof terrace with a comfortable staircase and enjoy a panoramic view of Mount Etna. 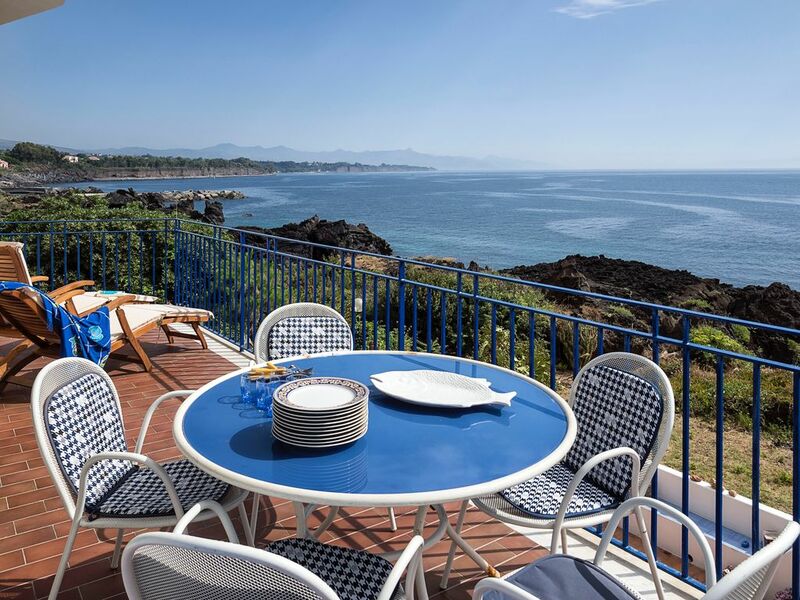 Casa Ionio further comprises a double bedroom with sea view, a simple kitchen, a bedroom with a double bed, two children's bedrooms, each with a bunk bed, a toilet and a bathroom with shower, toilet and bidet. The terraces are equipped with garden furniture. We loved it there in POZZILLO. Couldn't have been a better place to be! We had a fabulous week at Casa Ionio this August. The view from the balcony over the lava rocks to the sea was stunning and we enjoyed several evening barbecues up on the roof terrace watching the sun go down behind Etna in one direction and the sea in the other. The house was clean and well equipped - lots of cutlery, crockery, towels, and there were three different outdoor seating areas, which meant you could always find shade if you needed it, or a sunlounger if you wanted to sunbathe. Swimming off the rocks was better than we had expected: there was a little path laid down through the lava rocks, and metal steps into the water if you didn't want to dive in. Snorkelling was good and we saw lots of fish in the water. Alessandra the house manager met us at the property and was available by phone whenever we needed her. She speaks good English and took us for a little tour when we arrived to show us the supermarket in another village and to point out other restaurants. In the small village centre of Pozzillo (5 minutes walk away) there was a little bar by the harbour, a small restaurant where we had pizzas, spaghetti and granitas, and a small shop that sold all essentials. I would definitely recommend this property to friends or relatives. Big house with patio, sea-view balcony and roof top terrace with sea and Etna views. Sea access for a swim right in front of the house. Great place for a family holiday! My wife and I loved our week long stay. We were met by one of the owners of the property who was extremely friendly and spoke excellent English. She even gave us a little tour of the area to show us where to buy food, and the best local restaurants. The view from the balcony and roof terrace was beautiful looking out over the sea in one direction and mount Etna in the other. It was the perfect place for the rest and recuperation we both needed after busy working schedules. It was exceptionally hot a couple of days, but the fresh breeze coming off the sea was very welcome, and for the most part we didn't feel the absence of A/C and ceiling fans. It was also a good place to explore the NE of the island, half an hour from Catania to the south and Taormina to the north, and an hour from Mount Etna itself. wir fühlten uns in dem Haus sehr wohl und liebten besonders die Nähe zum Meer, den traumhaften Meeresblick und die ruhige Umgebung.Das Haus selbst war sauber und gemütlich eingerichtet.Die Küche war recht gut ausgestattet, allerdings hätten wir uns sehr über einen Wasserkocher und Toaster gefreut.Optimal war die Lage des Hauses, da wir relativ schnell viele Sehenswürdigkeiten erreichen konnten.Ein Auto ist jedoch unbedingt erforderlich. Unsere Kontaktperson Alessandra zeigte uns nach der Ankunft eine Bäckerei und einen Supermarkt in Pozillo, wo wir für unseren täglichen Bedarf einkaufen konnten.Ebenso empfahl sie uns eine Pizzeria in dem Ort, in der wir einige Male sehr gut und preisgünstig speisten. Wir haben unseren Urlaub sehr genossen und können sowohl das Haus als auch die Betreuung vor Ort weiterempfehlen. The apartment is very well appointed with everything you need. The lounge & front bedroom have doors on to the balcony overlooking the rocks & sea - great views across to Calabria - getting up early to watch the sunrise is well worth it ! There's a decent size kitchen, well equipped, and bathroom. The two bedrooms at the rear of the flat are a bit tired but ok. Our only complaint would be that we were not given enough info when we arrived. We were not shown how to access the two additional outdoor areas - the roof terrace which is huge & has a BBQ + great views of Etna - & the back balcony which gets the sun in the afternoon. The managers were, however, most helpful, bringing us wood for the open fire when it got cold & a clothes dryer, they were very anxious to help when required - grazie ! It would be useful if info on the local area was provided - shops, restaurants etc. There's a train station 10 mins drive away where you can travel up & down the coast to Catania, Messina, Siracusa, Taormina etc, if you don't fancy driving - Sicilian drivers are crazy, make sure you're fully insured ! You're within striking distance of plenty of attractions, you'll need a car. Don't miss Etna (about 1hr drive)- it's expensive 63 euros pp, but well worth it ! The apartment is in a nice residential area but the rest of Pozzillo is a bit shabby. We really enjoyed our stay & would definitely recommend it. Thank you very much for your review. Useful info about the local area is now available in the apartment! Prices are for up to 4 persons. For every extra guest there is an extra cost per week. The price includes final cleaning, water, gas, electricity, bed linen and a set of towels for every guest. Security deposit is 100 euro.